Sunday afternoon I went to Jo-Ann's specifically for a magazine that I need for my guild programs. Of course I went armed with my coupon flyer from the Sunday paper. I usually use the coupon on project storage boxes, but they were on sale at 40% off, so I got two. Couldn't use the coupon. Heading over to the magazine stand I passed the holiday decor aisles and noticed everything was 30% off so I picked up a tablecloth for the guild's potluck lunch Saturday, a pair of groovy socks for the Queen Mother (MIL), and a few other items. Nothing qualified for the coupon. Thinking I might find some Peanuts fabric, I perused the racks of fabric. I couldn't pass up this lucious paisley so I bought a little over 4 repeats (1-1/2 yards) to demo the 4-patch posey technique in a class I'm teaching in two weeks. On sale, couldn't use the coupon. Frankly, I haven't purchased fabric at Jo-Ann's in a long time and I was impressed with both the choices and quality -- but not the prices. Oh, I did finally get the magazine and it only cost me $81!! Earlier last week I had gone to The Quilter's Path in Mt. Juliet, knowing that Merita would have red grunge. I figured 1/2 yard would be sufficient. Somehow that half yard morfed into 5-1/2 yards. In addition to the red I got a yard of the brown Grunge, a yard of pretty blue with an Asian look, two yards of an interesting tan to go with my taupey-tan collection, and a solid lavender. Except for the blue, I have a plan for all of these. Bottom line: the stash took a hit last week. It could be worse, I suppose. I have several projects nearing completion and with the S'mores retreat later this month I should be able to move the net used closer to zero. We are having such pleasant weather here in Middle Tennessee. Wish I could bottle it and send you some. Look at some of the cute fabrics I'm using in my Halloween swap blocks! You can read about Denise Russart's Spooktacular Block Swap here. I have finished three sets of 3 blocks already; one or two more sets to go. Since I don't want to spoil the surprise for other participants in the swap, I won't show the blocks just yet. But I do want to share with you a dilemma I was faced with (pun intended). If you are a quilter, you have probably already encountered the challenges of dealing with directional fabrics. In one of my blocks I needed half-square triangles in all four orientations. And I wanted all of my heads pointing up!! My solution was to use the "Magic 8" technique. There are many sources online for this, but essentially you start with two squares of fabric, placed right sides together. Draw diagonal lines in both directions X, then stitch 1/4" from each side of both lines. Cut apart at the midpoint, first vertically and then horizontally +, then cut apart on the diagonal line. You will end up with 8 HSTs! In my case I needed 2" finished HSTs so I started with two 6" squares. I also needed 16 HSTs so two sets of squares did the trick in no time at all. It takes more time to trim them to size than to make them. Our state guild association had it's annual meeting on Saturday. Jenny Doan of The Missouri Star Quilt Company was the featured speaker. Oh, what a dynamic presentation and so many intriguing ideas! Probably the largest number of vendors in a long time, too. I held fast, but couldn't resist this yard of Halloween print and a fat quarter bundle of Moda Grunge. To see what other quilters are working on, pop on over to Patchwork Times. A couple of weeks ago I said I'd share some tips on using flannel-backed tablecloths in quilting. Well, life got in the way, but now I'm ready. Many of us use flannel-backed tablecloths as design walls, especially when we go to classes and retreats. The dilemma is always how to attach it to the wall, especially when you can't put holes in the walls with nails or push pins. And hard as you try, blue painter's tape just won't hold over time or when the weight of your quilt top exceeds its holding power. The solution someone in the S'mores came up with -- Command brand hooks and binder clips! Attach several Command hooks near the ceiling or high enough to hang the tablecloth. Roll a bit of the tablecloth edge down so the binder clip can get a good grip. Then hitch one of the clip handles over the hook. Follow instructions carefully when removing the hook and there will be absolutely no evidence it was ever there. I have done this in hotel rooms and even on cruise ships. Our group ran into a problem at the retreat center we use, though; the hooks will not stick to whatever kind of paint they used on the walls. Not to be thwarted, we now binder clip our tablecloths to the perimeter runners of the dropped ceiling! Flannel-backed tablecloths, especially the cheaper ones that don't have a lot of flannely stuff on the back, can be cut into large squares for laying out blocks. Keep these at the cutting table and as you cut pieces for a block, lay them out in position on the flannel side of the tablecloth square. You might be able to see in my example that I have several of the same blocks stacked on one square. I learned to do this with batting squares, but here's the thing: Not only does the flannel backing keep the block pieces in position like batting would, but you can stack additional tablecloth squares with blocks on top of the others without the pieces below sticking to the plastic side of the tablecloth! Geesh! Getting this example out of the box to photograph reminds me that I need to either finish or scrap this quilt. That orange was the wrong choice of fabric and I've had a hard time progressing past the center of the quilt. I think I'll take it to retreat next month and see if there's any way to salvage it. I'm linking up with Connie K at Freemotion on the River for Linky Tuesday. If you're not a frequent reader of Connie's blog, it's worth a visit to catch up with her Pelican Brief! Am I the only one with this personal flaw? Attempting to create order from my disorder so I can concentrate on the matter at hand (writing a pattern), I started to organize a stack of pages I've pulled from old magazines. One or two projects captured my attention and the next thing I know I've pulled fabric off the shelf, trying to find enough of the "right" fabrics to recreate the project on the page. More disorder!!! 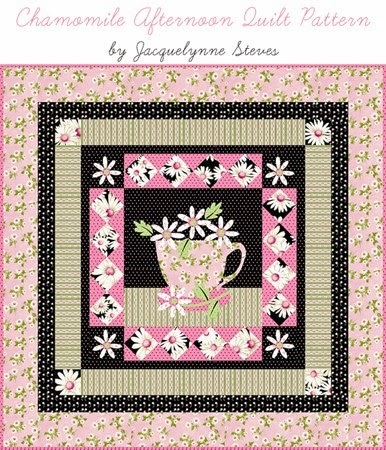 Captivated by the freshness of this little project (44" square) from Jacquelynne Steves at The Art of Home, I have tentatively chosen this fabric as my starting point for the tea cup. I think I was initially drawn to the pink and black color scheme, but this fabric reminds me of flow blue china--perfect for an old tea cup. Besides, it's been in my stash for a really long time and needs to be used! I have a couple of dark blues to replace the black in the pattern and an assortment of fabrics in similar colors to pick from for the other parts. And now I've also gotten side-tracked by a Halloween block swap Denise Russart is hosting at Just Quiltin'. I've never done a block swap outside my close group of friends. I remember my mother getting sucked into a block swap back in the 70s and how problematic the "demands" of the other participants became to my sweet mother. She may have even uttered a few choice words ... just sayin'. I'm hoping block swaps have progressed beyond that point today! So that's my design wall report for this Monday, such as it is. Heading out to our monthly guild meeting where I'll be cutting Halloween fabric, hoping to avoid serious weather developments later in the day. Although we returned from WV almost a week ago, things at home are just now returning to normal. I haven't mentioned that while Alex and I were vacationing, the Queen Mother (MIL) got sick and had to be hospitalized here at home. SIL did a masterful job of getting her to the hospital and handling all the minute details so that we did not have to rush home. We had been so looking forward to this trip because the 24/7/365 care of his mom its taking a toll on Alex. We do have full-time sitters with her here at home; however, it takes two to transfer her from bed to chair, and just the pressure of being available if needed when you still have a home business to maintain is taxing. QM was released with instructions for a liquid diet, so we have spent much of the week learning how much to thicken liquids and how much to liquefy solids. After a visit from a home health specialist Friday we have determined we can pretty much return to a normal diet with a few modifications. Can you hear the sigh of relief from this chief cook? As a result, I have not even touched my machine this week. But I did cut a back for French Braid and took it to my LAQ yesterday. Five yards of that recently-purchased wide fabric is now back out! I chose a gold thread for everything except the blue cornerstones which will have aqua thread. There will be loose feathers up the braid, loopy figure-8s in the separating strips, and curly-ques up the blue squares. I don't remember what I asked for in the borders but I'm sure it will be lovely. My LAQ always does a nice job. 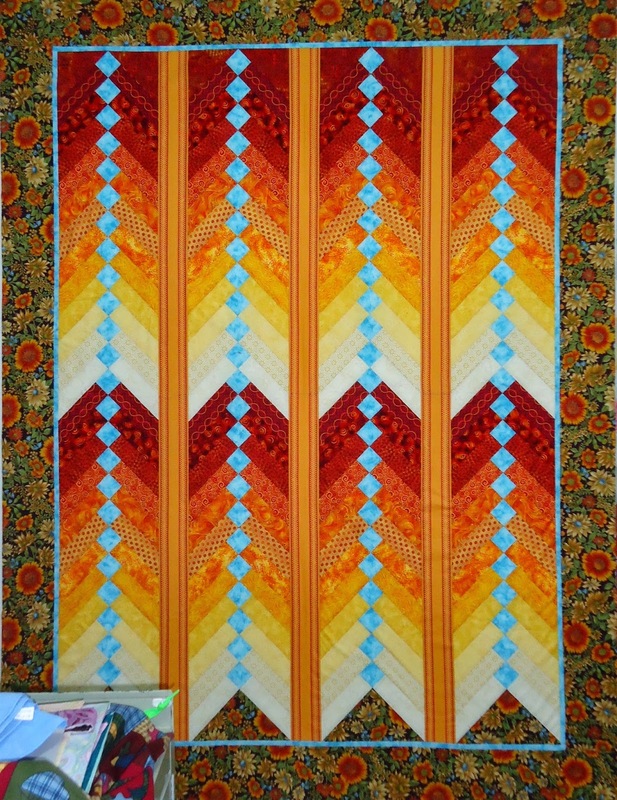 Linking up with Judy at Patchwork Times for the Sunday Stash Report. Having been on vacation in West Virginia all last week and enroute home today, I cannot show you the progress on Mary's Triangles on my design wall. But I CAN show you what's on my design mind. Last Tuesday I had the thrill of seeing Frank Lloyd Wright's Fallingwater up close and personal. 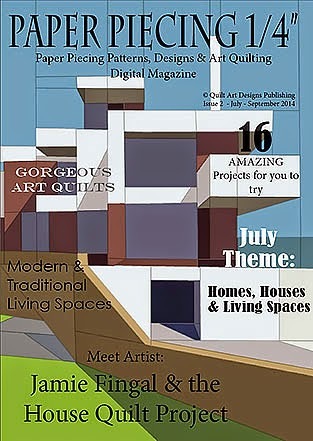 Later in the week, Connie at Free Motion by the River blogged about a digital magazine that included paper-pieced houses. One of the houses bears a striking resemblance to Fallingwater. I can see myself using this pattern as a starting point to recreate Fallingwater. What do you think? To read about my many adventures last week, scroll back through the last few posts. And to see what is on other design walls, pop on over to Patchwork Times. ... when you see the MetLife blimp in a field. Golf junkies will know what I mean. My Main Man and I have been at The Greenbrier Classic all week in White Sulphur Springs, WV. I was thrilled to round a corner on the back roads and see Snoopy tethered in a field about 10 miles from the tournament site. Can't have TV golf without the MetLife blimp! Yesterday we took a break from golf -- mainly to give our poor feet a rest -- and ventured up to Hawk's Nest State Park where we enjoyed a quick tram ride to the canyon floor and a "jet boat" (I use that term loosely) up the impounded lake to see the New River Bridge, the longest single span bridge in this hemisphere. While there have been no stops at quilt shops -- yet (there's still the trip home) -- I do have an adjustment to my stash report as I made an error in my calculations last week by counting 3 yards of wide back as 9 yards. Actually, based on square inches, it's more like 7.75 yards, so I'm taking 1.25 yards off the amount in. Really, I just wanted an excuse to post another beautiful skyline photo, this one this morning. I have to say, West Virginia is my favorite state -- well, in terms of scenic beauty, anyway. Here's the view from our hotel room in North Beckley, WV. We are here for the week to enjoy The Greenbrier Classic golf tournament. If you know anything about WV, you know that The Greenbrier is more than 50 miles from Beckley. Hard to believe, but this was as close as I could get. So each morning we drive 45 miles to the state fairgrounds in Lewisburg where we park and board an air-conditioned bus to The Greenbrier where we disembark and walk, walk, walk to the entrance gate which is still a distance away from the first hole. I so wish I had purchased a FitBit or something similar to measure all my steps this week! And with temps in the 80s and humidity near 100% I have to be losing weight just by sweat alone! Monday morning we went to the course for a dry run on timing, etc. and to scope out the prime viewing spots on the course. I purchased "Benefactor" tickets almost a year ago which give us access to an air-conditioned tent for food and beverage, as well as "country club" porta-johns. Smart move! ... and Fallingwater (probably his most famous home). My Main Main is an architect who has admired Wright all his life, but Wright has been a favorite of mine, as well. We got lucky and got bumped to earlier tours at both locations. Nevertheless, it was a very long day. One I will remember for a long time. Wednesday we slept in and made our way leisurely back to the course for the Pro-Am. Again, we weren't as interested in the golf as looking for good viewing spots for the tournament which begins today. I'll leave you with a shot of our typical sunrise here (Alex was driving ...).